Among patients with major trauma, prevention of hospital-acquired pneumonia is a major clinical concern. Some data suggest that administration of stress-dose hydrocortisone may decrease the occurrence or severity of nosocomial pneumonia. In a randomized placebo-controlled trial that enrolled 150 patients admitted to the hospital with multiple trauma, Roquilly and colleagues Article assessed the efficacy of intravenous stress-dose hydrocortisone therapy (200 mg/d) for the prevention of hospital-acquired pneumonia in the first 28 days after injury. The authors report that compared with patients who received placebo, patients who were treated with stress-dose levels of hydrocortisone were significantly less likely to be diagnosed with hospital-acquired pneumonia. In an editorial, Bulger and Cuschieri Article discuss benefits and risks of corticosteroid therapy among severely injured patients. Cardiac troponin I assays have become increasingly more sensitive, but whether lowering the threshold for detection of plasma troponin improves clinical outcomes among patients with suspected acute coronary syndrome is not known. In an investigation of this question, Mills and colleagues analyzed data from patients with suspected acute coronary syndrome who were admitted to the hospital before and after the hospital implemented use of a sensitive troponin assay. The authors report that lowering the diagnostic threshold for detection of myocardial necrosis through implementation of the sensitive troponin assay was associated with increased diagnosis of myocardial infarction and improved identification of patients at high risk of reinfarction and death in the subsequent year. Evidence that fibrates have clinical benefit is inconclusive, and little is known about how fibrates are used in practice. Jackevicius and colleagues analyzed nationally representative pharmacy audit data from the United States and Canada to examine current trends in the use of fibrates. The authors found that fibrates are used commonly in the United States and in Canada. They report that fibrate use increased steadily in the United States between 2002 and 2009—an increase that appeared to be largely driven by a steady increase in fenofibrate prescriptions—while fibrate use in Canada remained relatively stable. The benefits of regular physical activity are well established; however, anecdotal evidence suggests that physical activity—including sexual activity—may trigger acute cardiac events. In a systematic review and meta-analysis of data from 13 case-crossover studies that investigated episodic physical and sexual activity as triggers of myocardial infarction or sudden cardiac death, Dahabreh and Paulus found that both episodic physical activity and sexual activity were associated with a short-term increased risk of myocardial infarction and sudden cardiac death. The associated risks were attenuated among persons with high levels of habitual physical activity, and the authors estimated that the contribution of episodic physical or sexual activity to an individual's absolute cardiac event rate is small. Levels of a novel biomarker identified in a small preliminary study might help physicians predict whether certain cancers are likely to recur or metastasize. Join Monica Morrow, MD, Wednesday, April 20, from 2 to 3 PM eastern time to discuss whether women with invasive breast cancer and sentinel node metastasis should or should not have axillary dissection. To register, go to http://www.ihi.org/AuthorintheRoom. How would you manage a 61-year-old woman with unprovoked venous thromboembolism? 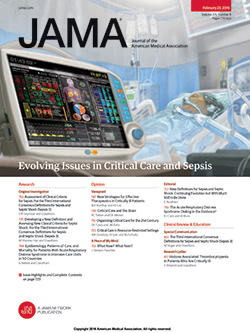 Go to www.jama.com to read the case, and submit your response, which may be selected for online publication. Submission deadline is April 3. For your patients: Information about panic disorder.